Monthly Strength Period More Important This Month? The market has a quite consistent long-term pattern of being positive for a five or six-day period beginning near the end of each month. We refer to it as the ‘monthly strength period’. On average the market tends to make more than half of its gains each month in those five or six days. It’s much more pronounced in bull markets than in bear markets. (It tends to disappear as a pattern in bear markets). Back in the 1970s and 80’s Norman Fosback, of Market Logic fame, ran a short-term trading portfolio on the strategy for years, which Mark Hulbert reported was one of the best-performing strategies his Hulbert Financial Digest had ever tracked. The pattern is fueled by the extra chunks of money that flow into the market automatically at month–end, for instance from those who dollar-cost average into the market on a monthly basis, month-end dividends marked for automatic re-investment, monthly contributions to 401K and other deferred tax plans, etc. It usually starts a day or two before those chunks of money arrive as traders jump in early in anticipation of the brief bump. The ‘monthly strength period’ this month is typically due to begin on Thursday and to run through Thursday of next week. The other side of the pattern is that the days following the ‘monthly strength period’ are often negative, as traders sell to take their quick profits. This time might be more interesting than most, given the market’s already very overbought condition both short-term above 30-day moving averages, and longer-term above long-term 200-day (40-week) moving averages, the already high level of investor bullishness, insider selling, and the important economic reports that will coming out next week. They include the monthly jobs report for May, which will be potentially important to the Fed in its decisions regarding whether or not to begin dialing back its stimulus efforts. Unusual overbought condition on long-term charts. 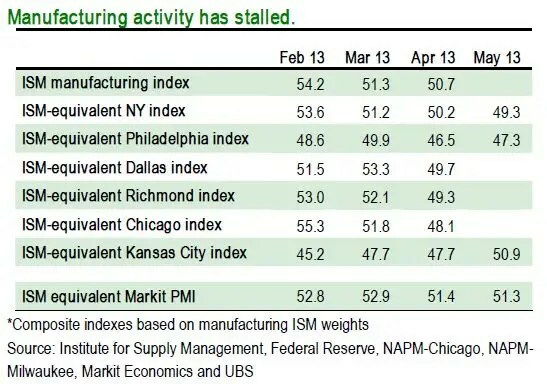 Here’s why this week’s Fed district mfg index reports may be important. Among this week’s economic reports will be the Richmond Fed’s Mfg Index, the Dallas Fed’s Mfg Index, and the Chicago PMI, which is often a telltale for the national ISM Mfg Index. Here’s the situation with those reports so far this year. More indications that budget deficits are already history, at the state level anyway. Last week, Florida officials finished paying back the state’s $3.5 billion loan from the Federal government, which had been used to make additional unemployment payments during the worst of the 2008-2009 recession. Total interest paid on the loan was about $99 million. Meanwhile, the New York Times reports that California, which was running a deficit of approximately $60 billion just three years ago, with all the dire doomsday forecasts that accompanied that situation, will have a budget surplus this year of between $1.2 and $4.4 billion. It’s estimated that much of the surplus may be a one-time thing, brought about by wealthy Californians taking profits on investments before the Bush era tax cuts expired. To read my weekend newspaper column click here: There’s More To Consider Than Just The Fed! Subscribers to Street Smart Report: The new issue of the newsletter will be out tomorrow afternoon in your secure area of the Street Smart Report website.